I love to cook with my TEFAL wok. It’s non-stick type of wok with an unique design of Thermo-Spot™ heat indicator right at the centre of its cookware. So does my wok, of course! It gives you the green light to start cooking on it, when it turns red. I find this thermo-spot is perfect for any first-timer who does not really know when is the best time to start putting in oil or food to cook. Even as a seasoned cook like me (chuckling), I think it is still good to ensure the right temperature (by looking at the occurance of solid red of the spot on the wok/ pan) to start cooking my favourite dishes. I love Tefal cookware such as wok (for sure), and frying pan in various sizes. Its superior non-stick interior makes it easy for cooking and very easy to clean up after use! Do not use scrubs to clean this cookware. Normal sponge will do, as any residue of food e.g. burnt substance is never too difficult to be washed away using just the normal sponge with a little dish washing soap. Gently wash this non-stick cookware not only prevents scratches, it helps to retain its long lasting non-stick effect of the cookware. My tips to you for first time use of this non-stick wok is to soak the wok/ pan with warm soupy water for just while, in order to clean the cookware thoroughly. Dry the wok/ pan with clean towel, if it is wet or damp when heating it up on the stove. This is for you to save some energy/ gas. If you have seen the funny TV commercial of Tefal, cooking sunny-side-up egg is never been so easy with Tefal frying pan. So as to cooking omelette! I like to use my Tefal wok for omelette. It helps me to make my omelette to stay in perfect shape, with just one-time flipping! One of the great advantages from this Tefal wok is to help you in saving cooking oil. Less or no oil is required to cook eggs, hot dog, or luncheon meat on Tefal wok/ pan, and you can still make the food tasty, and nice looking ones. I got my Tefal wok at Tangs or NTUC Finest Supermarket. Always look out for discount/ promotion rates from these store, a 20% discount will be offered during GSS or some in-house promotion offer. One point to note: If you were to go for promotional items, most of the frying pan/ wok will not come with the lid. However, the offer price is surprisingly great. I bought 2 frying pans without lid (in 2 different sizes) at only S$19.90. If you really need the wok lid like me, go for the regular item when it is on sale or get it at percentage discount if you have the membership of these particular stores. 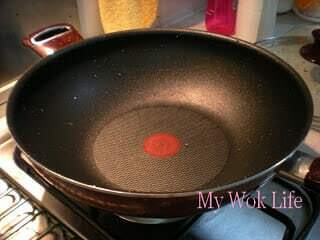 I have this new wok of mine from Tangs at 20% during sales season few months ago. This 10″ wok with lid sold at S$90. Tips: Use wooden spatula on this non-stick wok to prevent scratches on its surface. * I like only the Tefal wok and frying pans. I used its rice cooker before, but don’t really like it though.